In 2001 American energy and services company Enron collapsed into bankruptcy. Apparently, its managers liked their bonuses more than they liked the truth, and their own paychecks were more important than the success of the company. Parmalat, WorldCom, Madoff, AIG, Barings… corporate history is littered with the remains of organizations that allowed individual greed and egos to outgrow the solvency of the company. Rewards are among the trickiest and least understood tools in management. When applied in the right way they can generate significant results. Unfortunately, many managers still assume that money is the best way to make people work harder, longer, or more efficiently. And they also think money works best when implemented as a financial bonus. Stupid, because both assumptions are wrong. Scientific research teaches us that incentives for performance actually work the other way around. The anticipation of a reward (money or something else) works contra-productive since it kills people’s intrinsic motivation. People no longer do things for the joy of the work. It isn’t a good feeling about a job well done that they are expecting anymore. They are expecting a reward. It’s called the overjustification effect. And there’s another problem with bonuses. Since people’s focus is on “getting a reward” instead of “doing a good job”, it increases the risk of cheating. Rewards based on outcome encourage people to take the shortest path to that outcome. Bad behaviors with dysfunctional side-effects undermine the organization’s performance, while the employees walk away with a bonus. Or worse, with their colleagues’ pension funds. Taking the widespread use of bonuses in account, we can draw a sad conclusion: One of the biggest problems in the world is transferring the managers’ focus from extrinsic to intrinsic motivation. 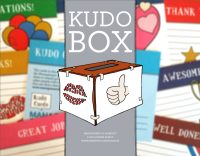 This post is part of my new article called the Kudo Box. It includes a list of literature references. If you want to stay up-to-date and receive all my upcoming articles, feel free to subscribe to my Management Workout mailing list. Nice one! Just written about “the risk of wrong metrics” http://pierg.wordpress.com/2012/10/31/the-risk-of-wrong-metrics/ … that’s a similar topic! Having worked for Enron when they were an energy service firms, they went to the dark side when they became an energy trading firm. They only made money on trades, moving away from actually delivering energy. In that paradigm, it was 100% commission. But I know of no product development firm where “bonuses” are paid that are not part of the normal compensation based on tangible measures of performance. Our firm pays bonuses on earnings for the quarter. Some call it profit sharing. The sales staff gets commissions on orders booked, but only gets paid on revenue. Not everyone is incented by money, you are correct. But for those who are, bonuses, profit sharing, incentives are very good tools for focusing their effort. Paying a fair salary is the starting point. You may want to do some fact checking to determine the spread of staff in a typical firm that receive incentive pay. I’d suggest they are more likely to be on the business development side, where that is common. The unethical aspects of Enron resulted in SOX. As well as reporting executive compensation in the 10K (Quarterly) for the shareholder. So while Enron is a common example of the sins of the past, you may want to check to see how many firms – publicly traded firms – today have incentive for unethical or illegal behaviour – in the case of the Enron traders in the California energy distribution market. If as you conjecture bonuses “increase the risk of cheating,” I’d suggest the firms governance processes are broken, not the concept of bonuses. You can offer positive motivations such as rewards and other bribery or you can use negative motivation such as threats and blackmail. Either way, extrinsic motivation is crude, easy and often effective. I am not interested in fact checking to see how many people believe in a god. No matter how many there are, it doesn’t make god more real. I am also not interested in knowing how many firms use bonuses. This is irrelevant when research has already proven that they have little or no effect. See Deci & Ryan, Alfie Kohn, Daniel Pink, etc. A discussion which goes into the same direction of cheating introduced by extrinsic motivators can be found in the German article http://www.umsetzungsberatung.de/personal/anreizsysteme.php: Teamgeist-Unterhöhlung durch individuelle Incentives. (English something like “Incentive systems: Team Spirit Undermining by Individual Incentives”; perhaps try Google Translate: http://translate.google.com/translate?sl=auto&tl=en&u=http%3A%2F%2Fwww.umsetzungsberatung.de%2Fpersonal%2Fanreizsysteme.php). So what is the difference if the extrinsic motivation goes to a team rather than individuals? Following the article this might be the better approach unless the affected team has again dependencies to other teams.